Corporate Communications Manager @ Zerodha, perpetual student, an eccentric Grammar Nazi, rock lyrics police and voracious reader. why no holiday on jan 1?? Why fallow world if they don’t care about Hindustan. No! Because people like you can’t take constructive criticisms on blindingly obvious things which requires change, and expect others to accept sh!t as is and be proud of it. Indians still have a bad image, don’t expect sh!t to vanish magically until you clean the sh!t up! This is generally a November-March cycle. The exact date depends on when the daylight savings time changes. Hope in new year Kite platform is more stable, scalable and able to trade on volatile trading day .. I hope in 2018 Kite will be much more better with 2hr and 4hr Charts. Further my favourite Pi will have Ichimoku Clouds included in the Studies section. Thank you Nithin for providing such wonderful platforms for trading. Love Zerodha! Happy new year guys in advance. Why not refferal amount credited to account? Wish you Healthy, Wealthy & Happy New Year !!!!!!! Happy New year advance ZERODHA SUPPORT TEAM. Thanks for advance information and well supported Zerodha team and same will maintain in future. Is there any way by which these dates can be automatically synced with google calendar? I’ve just added the link to the Google Calendar for this list. You can click on the link and add it to your own calendar. The calendar cannot be added in one go. We need to click on each individual event and click on “add to my calendar”. Can you please provide a link to add the entire calendar in one go? On the bottom right, you’ll see “+ Google Calendar”. Click on this to add the entire calendar in one go. Happy New year in advance to Zerodha friends. Kite3 is web based… Is there similar change in mobile app. The mobile app will be updated in the coming weeks. Thanks Team Zerodha for your effort and support. Thank You Zerodha Team. Our local group of traders really appreciate your efforts. Am really glad and proud that such excellence exists in good ol’ India. Here’s wishing your team even greater laurels. Happy New Year in advance. Very happy new year for all zerodha team. Thanks for the update and Wish you Happy New Year 2018.. Happy New Year Zerodha & all Team. zerodha is comfortable platform for share market trading and not disturbing in any way to clients. Good maintanence in finance and account segments. thanks to zerodha team. That,s good to known about holidays but it will better if we got a mail & text message on all mondays to know the coming holiday on that week. Hey Naveen, you can add this to your Google Calendar and get alerts. 🙂 The link is at the end of the post. Happy new year to everyone and zerodha team. Wishing Mr. Nitin and all this excellent team members, a very happy and prosperous new year 2018. I Wish & pray almighty, the Zerodha customer base be doubled in 2018! Thanks in Advance for your effort and New Year. Thank you zerodha .Advance happy new year to all. No holiday in April June July. It is Bakr-EID and not Bakri EID. Or, another form is Eid al-Adha. Thank you zerodha .Advance happy new year to all….. Many thanks for the list. When we place an order, the window appears in the bottom middle [ laptop ] .. If this can be dragged around, it will help a lot for viewing many things simultaneously.. VERY … VERY HAPPY NEW YEAR…. 2018 WITH MARRY CHRISTMAS ……. I WISH TO ALL HUMAN BECOME WEALTHY IN NEW COMING YEAR…..
AND ALSO PRAY GOD TO GIVE SOME GOOD THOUGHT WHO ARE BEING STILL EFFORT TO MELT THE HUMAN CULTURE FROM THE EARTH. …. No Buddha Pournima 30-Apr-18? It’s a bank holiday in Maharashtra and was a NSE holiday in 2017. You can just go to kite3.zerodha.com and login with your Kite ID and password. Thanks Zerodha…We Wish you happy New Year!!!! December 1st is a Saturday Dhiraj, so it’s a holiday anyway. Please add price alerts to KITE. Happy New Year 2018..Lets make 2018 more successful. 07-Nov-2018 is not a holiday as per NSEINDIA website. Refer https://www.nseindia.com/global/content/market_timings_holidays/market_timings_holidays.htm. Select period 01-01-2018 to 31-12-2018. This is the list we received from the exchange. 🙂 It’s Diwali, so it’s definitely a holiday. There will be Muhurat trading though. written 22nd may instead of 22nd august pls correct. Thanks for pointing out. I’ve corrected that. Very informative..but hard find this link from Zerodha main page ..I came to link through Google search and directly from Zerodha..
You can apply for o[ening an account at any time Ajay. The back-end process will, of course, be done on working days as this involves uploads to the exchanges and depositories. money transaction cannot done to bank account on 27.03.2018.Why? 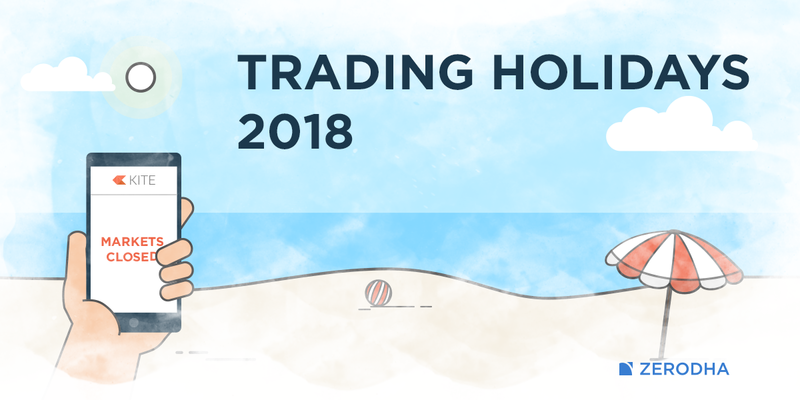 Why the hell so many holidays, if corporate gives us only 10 calender holidays then why 16 for trading……this is ridiculous….can somebody take this up? Kindly check and resolve the difference issue immediately. Why investment Money and Holding Shares and P&L not showing correctly, april 2nd also not in calendar as a holiday. Shares bought on 28th March wouldn’t be visible today. Read more here. May 1 is first celebrated as labour day. Do change in the article mentioned. It’s been mentioned as Maharashtra day. Hey Ananth, this list is merely a reproduction of the exchange circular. Check it out here. Is there anyone make profit in share market? Mahatama Gandhi Jayanti October 02, 2018 Tuesday.. Please check spelling mistake of Mahatma.. Thank you for pointing this out. We’ve made the correction. Hey Vaibhav, it takes up to 48 working hours for your PoA to be processed. Bakti id ko holiday ho sakta he to shree krishna janmashtmi ko kyu holiday nahi he ye hindustan tha sayad! Please check and correct from your end. Thanks. It’s urgent. Hi Darshan, the holidays are decided by the exchange at the beginning of the year. Owing to the way our festivals may change dates based on various factors, it would be infeasible to always have the holiday on the exact date. i love the comments, there is one which asks about holiday on 1st and leads to comments like india is no where. I like the crowd that is reading varsity. On 17/11/18 working day ? 17th is a Saturday, so it’s a holiday. Please share holiday list for 2019 so that we can add to google calendar. The last one was very useful.